Over recent years, thousands of residential clients in the Greater Houston Area have chosen Guardian Safe & Lock to protect their homes and families. We specialize in complete home security solutions to protect you, your family, and your home providing residential locksmith services that will best fit your needs and budget. Our trained technicians travel with mobile workshops that carry a wide selection of products, with everything from heavy duty strike boxes to keyless entry systems. We provide our customers with all the necessary security products that allow you to sleep easily knowing that your home is secure. When you are locked out of your home there is no reason to break a window or do any type of damage to your house. The best option is to call a professional locksmith, there is no reason to weaken the security of your home by attempting to do it yourself. We utilize several different methods to gain entry into your home and will be sure your property is unharmed during the process. Most locks work off of a pin or tumbler system and can be picked by a professional residential locksmith technician. If the lock is unresponsive to picking, the lock will need to be drilled. It is important not to drill your own locks because novice drilling may result in permanent damage to your door or will leave the device unworkable. As a homeowner, you should always be concerned about what the state of your door hardware is at any given time. Homeowners should make their locks a top priority and should always be looking to upgrade to a more secure option. Many homeowners who purchase and install their own door hardware assume that these locks will keep their doors secure forever. Homeowners should remember that the locks that are sold at the local hardware store are usually low-quality grade three hardware. There are several reasons that would prompt homeowners to want to change out their locks. One of the reasons being they have started to notice some of the warning signs of a degrading lock. Another reason to upgrade your locks would be to change from your standard grade three residential hardware to a more secure and durable grade two hardware. With the presence of smart locks, the future of the security industry is here. Smart locks merge the convenience of automated technology with the security that door locks already provide. Other than that, smart locks help homeowners cast a wider security net over their homes even at remote locations. Smart locks are breaking new ground as they work to reinvent home locksmith security. Some of the more common features of smart locks include remote entry, multiple users, digital keys, and integration with home automation. Smart lock installation is definitely something that many homeowners should do their research on and should be taking advantage of now. The process of rekeying your home usually begins with the main points of entry. This includes the front door, back door, and interior garage door. Rekeying a lock allows the door lock to be changed internally, rather than replacing all of your door hardware. The only thing that changes during the rekey process is the key and internal pins inside the lock itself. Upon completion of rekeying your home, you will be issued new keys. The old keys will no longer match the internal pins in the lock cylinder, rendering the old key useless. Our mobile residential locksmith technicians have all the necessary tools to get the job done and give you peace of mind! It is understandable that keys will break from time to time, especially if the key is old and it is constantly being used. If you are presented with this situation call a professional locksmith to extract the broken key and prevent further damage to the lock’s keyway. 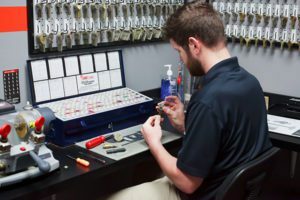 Our professional locksmith team will extract your key from the lock and will make sure that your hardware is in working order. In most cases, we will be able to copy the broken key and make you a new copy of the previously broken key. They will also advise you on how to best avoid having your key break off in your lock again. Pay attention to the way your key and lock hardware work together, and if you notice anything out of the ordinary gives us a call. Please describe your project or specific needs. Guardian Safe & Lock is a bonded, insured, licensed professional locksmith company that currently serves "The Greater Houston Area." ©2018 Guardian Safe & Lock. All Rights Reserved.